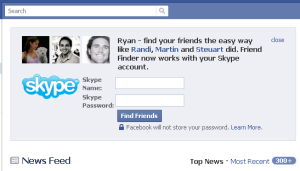 Skype’s recent release Skype 5.0 for Windows will include several Facebook features,according to an announcement made today by Skype’s representative. These functions include ‘Liked Results’ which will expand your search and will enlighten you about the recommendations and opinions of your friends regarding the theme of your search. ‘Facebook Profile Results’ application will make your search for people/friends more exact and fixed. Plus your private information and research results won’t be made public and you will receive notifications and updates about the release of new features from Bing. Ethan Beard, the director of the Facebook Developer Network, wrote on the official Facebook blog today that Facebook is working with companies like Skype to make it possible for its users to look for friends/people whenever they like. This post got a positive response from people through the 1,700 comments so far. This joint venture will prove to be beneficial for both Facebook and Skype in the time to come.